Many farmers and ranchers in the tri-state area of northwest South Dakota, southeastern Montana and northeastern Wyoming have been struggling into their second year of a severe drought situation. But Ollila says that if they make a plan on what they are going to do if the drought continues and then stick with it, they can find a way out on the other side. (Many) farmers and ranchers in this area know what to do in a drought situation, Ollila believes. But they have to be willing to follow the plan they lay out. SDSU Extension service helps with creating that plan with information as well as nitrate testing on forages, and livestock water suitability testing to determine whether the water will cause problems such as copper deficiency which causes polio. Ollila said the Cottonwood Range Research station at Philip, S.D. which records rainfall levels, has shown that since 2000 there have been 12 years where the rainfall in the three months of April, May and June was less than half the average for those important months. “We are used to being in drought,” says Ollila. “There are two things that have caught people up though including the ‘new normal’ we got used to with abundant moisture from 2013 to 2015.” He said one is the fact that, with abundant rainfall in 2013 to 2015, producers became used to a The other is that the cost of operating went up, causing the producers to run more head to make the same amount of money. Gary Deering, President of the South Dakota Stockgrowers, says he and his family have been fortunate in being able to hold on to most of their herd, and not have to resort to outside jobs to maintain the ranch. He lives and works with parents, Pat and Frankie, his wife Jessica, and three boys. But it hasn’t been easy, and they are making substantial changes to their operation, including buying hay, shipping some of their cattle to feedlots east river sooner than normal, and applying for specific programs such as the Emergency Conservation Program. “This program is helping us dig a well and get a pipeline out to our pastures that have no water,” says Deering. “This will get water where we need it, and also help our grazing distribution.” Deering says they have also received some financial assistance through FSA due to their D3 drought designation to help with purchasing hay and send cows out to other areas. Deering says he appreciates the Stockgrowers and also the Beef Council which oversees the beef checkoff program to help promote beef and fund research. He said that he is proud of how cattlemen, listening to each other, find ways to work together. Deering says the biggest challenge to a drought is the unknown, the not knowing if this is the year it breaks or if it will go on. “Another year would be a devastating blow to our region, however, having the ability to adapt to the ever-changing conditions, will once again get us through this challenge, and into greener pastures. Another Meade County rancher, Larry Reinhold who runs Lone Tree Ranch and Rainbow Bible Ranch east of Sturgis says things have not been good since they were hit hard with Storm Atlas. “Our area has been in the grip of drought for better than two years now,” says Reinhold. This has put a tremendous strain on feed supplies, ponds, and reservoirs. The big dam they use for camp water activities is mostly dry and this “pushes the staff,” according to the owner. They tried to keep young trees watered and lost a number of landscape trees. And they are plagued by prairie dogs which thrive on the short grass areas. “We continue to trust the Lord and have seen people from outside the area step up to meet the needs,” says Reinhold. “We are going to try and keep our basic cowherd and we must maintain our saddle horses for the camp.” Reinhold says it is difficult to watch the “slow death” that drought brings. Kevin and Collette Kirsch ranch in southwest North Dakota in Billings County, 20 miles north of Dickinson. They too have had to make changes and think about their long-term outlook. “We had a severe hail storm in 2016 at harvest time and did not make a lot of hay in that year,” says Kirsch. Killing frosts up to June in 2017 and a hot and dry June and July, made the hay situation sparse, causing them to hay wherever they could, including crop acres. “Government programs help somewhat financially,” says Kirsch, “But having the production is always a better return.” Kirsch, who has been a board member of the local CHS Grain Coop since 1993, says he has learned the struggles and benefits of knowing how crops are marketed, as well as opportune times to purchase inputs such as seed, fertilizer, and chemicals. The couple’s calf operation is run solely by them, with sporadic help from grown children or hired help. They have a cow/calf operation with about 125 cows which they have reduced to 100 head. “I am downsizing in three years by canceling all leased acres and partnership cattle,” says Kirsch. “We may continue with owned acres and cattle ‘till 2024 or quit before then.” The farm they bought in 1973 when he was just 19 years old, where he and his wife have raised three daughters and a son, will probably not stay in the family. Ollila, as both a producer himself and as part of the SDSU Extension team, encourages farmers and ranchers to be smart. He says that if they make a plan, stick with that plan and look for any other ways they can make it through, that the end of the drought is in sight. It may be a while yet, but it will end. If you are looking for homemade pies for your holiday feast, look no farther than Rainbow Bible Ranch. 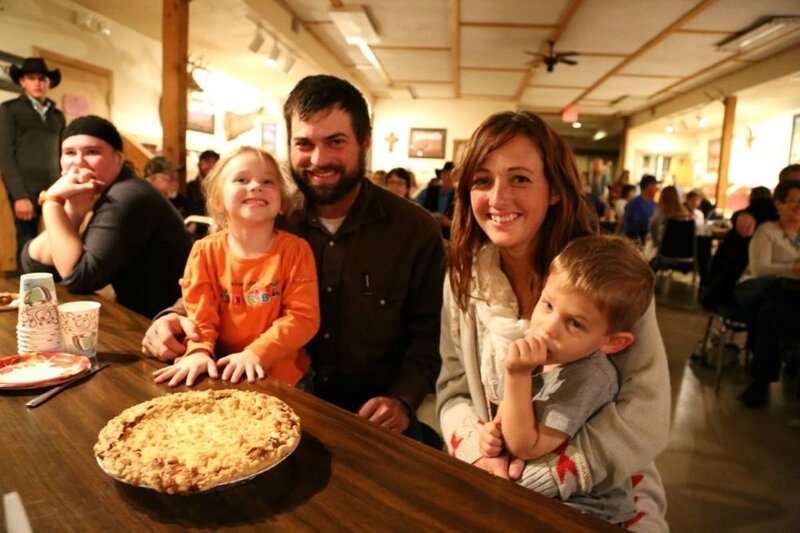 This year's Pie Auction, a fundraiser for the ranch, will be at 6:30 p.m. Friday. The first Pie Auction fundraiser was in 2011, said Larry Reinhold, whose family owns and operates Lonetree Ranch, home to Rainbow Bible Ranch. The event was a way to not only raise funds for the work of Rainbow Bible Ranch, which hosts youth summer camps, but also to share the opportunity and "sense of ownership" with some teenagers who attended camp and have served as staff members. "Even today, the majority of the pies are from these kids and their families. The projects that have benefited in past are chosen with the idea in mind that the kids will relate to them as being an important part of the program at RBR, especially in the summer camp program," Reinhold said. In the past, funds have helped to buy a pontoon boat and kayaks. After the devastating storm in the fall of 2013, the money helped in the restoration of areas at the ranch. "We had so many trees damaged in that storm, and with the money raised we were able to purchase trees to not only restore but to enhance the setting as well," Reinhold said. This year, youths in Rainbow Bible Ranch's Legacy programs will conduct the auction. The ranch offers camps for older youths called Legacy I and Legacy II during the summer. Then, throughout the year, youths from these programs meet for Legacy III Bible study and fellowship at Main Street Square in Rapid City. Reinhold said the auction will feature nearly 60 homemade pies. Funds raised this year will go toward some "not quite finished" projects, including finishing a tack room for all the equipment used by the campers, adding another cabin at Misty's Meadow and assisting in completing the Country Chapel where Sunday evening services will be held during the summer months. Rainbow Bible Ranch had another record-breaking year in attendance, with 483 campers from 12 states this past summer. "It is our continued desire to keep the camp fees as minimal as possible so that many families can enjoy what the ranch offers," he said. Reinhold admits that the camp fees are about half of what it actually costs to host a camper. "The Pie Auction is our only public fundraiser and proves to be a fun time of fellowship as people from all over bid to own a pie," he said. Reinhold said some have already placed requests for certain pies, and one woman says she will send a contribution if a certain baker will share her recipe for a very popular pie. "It is going to be a great night," he said. The 19th Annual Women's Winter Retreat will be held on Feb.24-25. Their main speaker this year will be Robin Reinhold. She and her family operate Rainbow Bible Ranch east of Sturgis. Many women from Meade County and the Faith area attend this each year. It will be held at the Calvary Baptist Church south of Rapid City. They will begin on Friday at 5:30 with fellowship, registration, and a meal. It will conclude on Saturday with the closing at 2:20 p.m. For more information, one can call Lori Wilken at 605-788-2855 or cell: 605-515-3786; email: glwilken@sdplains.com. Or you may email Linda Olsen at lolsen@lakotanetwork.com or Cell: 200-1311. The main theme is "Equipped with the Living Word of God." On Sunday, September 25 the annual Meade County Sunday School Convention will be at the Community Baptist Church in Union Center. The theme this year is "The Sovereignty of God". Registration will start at 9:00 and continue until 11:00 am. Sunday School classes for all ages will be at 9:30 - 10:45 am. The morning service will be at 11:00 am with Larry Reinhold followed by a pot luck dinner. The afternoon's speaker will be Larry Reinhold with specials from each Sunday School class as well as the attendance award presentation.